Year-after-year the use of digital advertising and the revenue generated from utilizing this form of advertising continue to grow. Many national brands have recognized the value of digital marketing by investing in digital for national exposure. 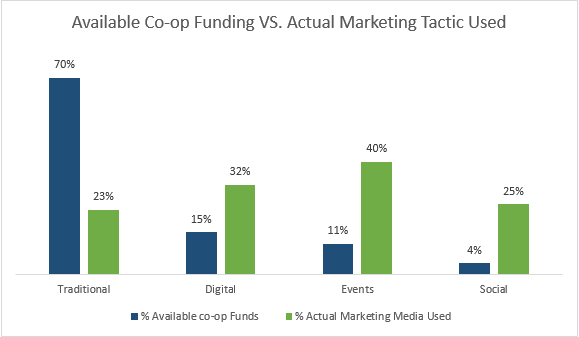 However, on the local level, vendors and the sector of the market that relies on co-op marketing funds are still reluctant in adopting and integrating digital co-op advertising into their marketing campaigns. As it is, co-op programs are complex to comprehend and manage. Therefore, adding a digital component to an already multifaceted marketing system is not widespread in the channel. Many believe that digital co-op advertising programs are slowing down the adoption of digital media advertising in the channel. 70% of all available co-op advertising dollars are still used in legacy media, 19% in digital media and 11% is dedicated to local events. Nevertheless, more than 90% of vendors are making the effort to join the digital advertising ecosystem by updating their co-op rules to persuade their partner the use of digital media in their co-op advertising. Email marketing, display, and paid search advertising are the first few forms of digital advertising widely known to be used in co-op advertising. For the longest time vendors viewed the local market unreachable. Traditional co-op advertising programs were considered a way for vendors to attract consumers to local merchants. However, digital has provided a flood of opportunities for vendors to get in front of consumers. By equipping their channel partners with the funds and tools to run their digital co-op programs, vendors gain the opportunity to effectively engage with local customers. 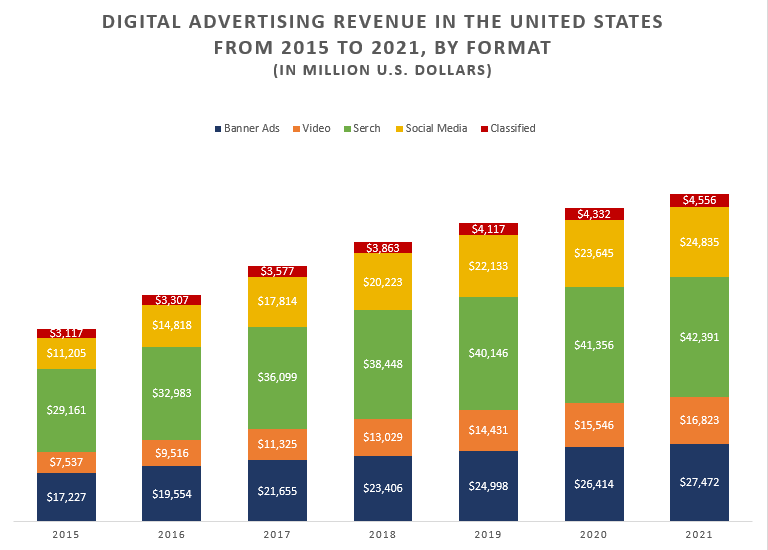 The digital media’s fast-paced changes and the overwhelming number of new platforms are considered by many vendors and their partners as barriers to adopting digital media for advertisement. In addition, the amount of knowledge and continuous learning required to run a digital advertising campaign are again challenging barriers for both vendors and their channel partners. However, as we mentioned above and illustrated in diagram 2, many partners are utilizing digital media in their local marketing campaigns. According to Brandmuscle, 57% of local partners are managing their own digital marketing campaigns but struggling to maintain and manage their marketing efforts. To assist these partners and those who are not utilizing digital marketing, vendors need to furnish their partners with tools and resources to harness the true value of digital advertising. Digital advertising is trackable, measurable, and more efficient. Providing partners with automated synchronized channel marketing tools such as MioDatos gives vendors the ability to effectively engage with consumers on a local level. Restructuring and automating your co-op advertising programs with data-driven features also helps partners save time creating and managing their digital advertising efforts. Supporting partners in their digital marketing can help them measure their local marketing efforts. The results of these marketing efforts can then be applied to the vendor’s network of partners. Most vendors are still practicing program rules that were structured for their co-op advertising years ago. Digital brings a new opportunity for vendors to re-create their co-op programs to reflect the current changes in consumer behavior and advertising. The lack of guidelines for a digital co-op advertising campaign has resulted in an inconsistency in the brand’s online messaging. In their new co-op guideline, vendors need to specify program instructions that encompass the use of digital platforms that make strategic sense for their brand and partners. It is important that vendors resort to tactics that generate the best results for their partners and provide funds and co-branded materials to optimize local marketing. Mobile, paid per click (PPC), and social media are currently the best online tools for capturing the local consumers. In using these digital platforms, vendors need to offer their partners tactics that reflect the vendor’s national marketing approach. In doing so, the vendor’s national and local digital campaigns will form a consistent consumer experience. Again, using an automated co-marketing platform such as MioDatos will provide partners with pre-approved materials containing the vendor’s logo and trademark, vendor’s tagline, colors, typeface, different templates, and all miscellaneous legal terms. Practically every co-op program requires a proof of performance. With digital co-op advertising, a reliable tracking system is needed to show proof of impression, reach, and delivery. Today, there are many 3rd party co-op program management companies, like Computer Market Research, that have expanded into digital to help fulfill vendor’s program requirements and provide support for running a digital co-op campaign. These companies use tracking data to verify proof of performance, brand integrity, and measure program compliance. When national digital ad campaigns are localized, vendors are able to learn the highest converting ad initiative and apply that plan to boost sales by geographical location. By removing the complexities associated with a channel, Computer Market Research is reinventing the way a business manages its channel relationships. The result is a streamlined, automated partner relationship management application designed around a company’s business rules. For customers needing modular solutions, CMR’s self-service software provides unmatched flexibility and scalability. This allows customers to build the most optimized platform to manage their channel. Customer-centric companies are 60% more profitable compared to companies that are not focused on the customer. Over the years, working within the channel, we’ve learned that vendors were having difficulty reaching the end customer while maintaining consistent messaging through their partners. The challenges these vendors faced were keeping consistent marketing messages, controlling their corporate identities and continuously motivating the resellers to put forth marketing efforts. On the partner side, we learned that partners don’t have the resources or tools to market themselves or their vendors. Partners’ biggest challenges being time and creating engaging content. The end results, partners do little to no marketing for their vendors or themselves. Our Co-op/MDF Management module provides unmatched visibility on channel spending for improved ROI. This cloud-based tool enables you to operate your Co-op and MDF programs on a global scale. Our Co-op/MDF solutions are entirely configurable so that channel management teams can build and deploy their own marketing programs that support their unique program guidelines.